The radar systems market is expected to grow at a CAGR of 5.88% over the forecast period (2018-2023). The scope of the report includes insights on the solutions offered by major players, including providers of hardware, professional services, and integration solutions. The regions included in this study are North America, Europe, Asia-Pacific, Latin America, and Middle East & Africa. The study offers insights on various end-user-based industries such as aviation, maritime applications, military & defense, space technology, weather monitoring, etc. The application-based radar use in airborne, land-based, and naval segments is also in the study scope. The knowledge of weather conditions is as important for industries as it is for the agriculture segment as it allows them to consider the factors they must keep in mind before planning anything. Weather monitoring, in fact, is also important to forecast and detect any changes in climatic conditions early. It warns the people and avoids/minimizes loss of the life and resources resulting from changing climatic conditions. The radar plays an important role in this as it continuously monitors the weather situation with the assistance of other devices that measure precipitation, humidity level, etc., allowing to forecast the conditions. For agriculture and businesses, it becomes important as it allows them to plan whether the raw materials will be available at the time of need or if there is a need to maintain an increased inventory. The logistics also plan the methods to transport the products accordingly, which may be through places that have different climatic conditions and might change during transit. Aerospace & defense needs to continuously keep track of aircraft to maintain the flight path and control air traffic. Any lapse or miss in tracking can turn into a catastrophic incident. There has also been an increase in unmanned aerial systems and drone systems that fly high in the air and need to be traced for strategic as well as safety purposes. Recently, the United States has made it mandatory for drone devices bigger than a specific size to be registered with the aviation wing for tracing them and avoid any airborne accidents. 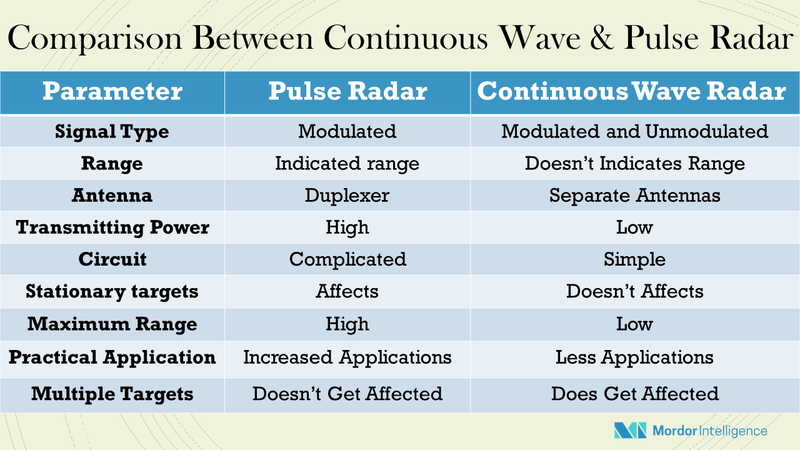 In defense, the radar needs are very versatile and need to fit to the varying demands, such as vehicle-mounted, naval ship-mounted, fixed radar systems or airborne radar system. The radar systems also help the ship navigate and avoid areas having rocky seabed. March 2018 - BAE Systems Australia welcomed the announcement by the Minister for Defense and the Minister for Defense Industry that the company has been selected to upgrade Australia’s long-range high frequency radar network. The Jindalee Operational Radar Network (JORN) protects Australia’s coastal approaches through a network of three remote radars in Queensland, Western Australia, and the Northern Territory. The USD 1 billion JORN upgrade will require over 500 highly skilled technicians and engineers working for BAE Systems and in the company’s supply chain. The major players include - Airbus Defense and Space, BAE Systems, Finmeccanica SPA, General Dynamics, Israel Aerospace Industries, Lockheed Martin Corporation, Northrop Grumman, Raytheon Corporation, Reutech Radar Systems, Rockwell Collins, Saab Group, and Thales Group, among others.